The surname was recorded in Annandale where they were seated at Kynemund. The name appeared in the 1990 Census as follows: Adams: 1:250 KY: 1:500 rest of the US except 1:750 in Upper Mid West and North East. British meaning son of Adam (="red" in Hebrew). In the 1770 the Adams lived in Rowan County, NC. Spencer Adams married Mary Townson there in 1774. His brothers included John, Spencer, Benjamin, Charles, William, and Jacob. Some believe this Family to be tied to the Adams of New England. They came into Kentucky from the Roaring River section of Wilkes County North Carolina. The Adams Colony was founded by Spencer Adams. In 1803 they departed their home and moved up to Holston and Clinch rivers to Pound Gap. The group intended to settle in the Bluegrass, but were delayed by a snow. They encamped on a tributary of Rockhouse Creek (named Camp Creek as a result) and found the fertile ground and ample game to be appealing. A council of the elders decided the group should settle in the headwaters of the Kentucky River. 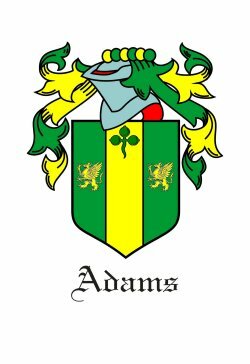 The Adams Colony included James Webb (Rev War Vet) and his family, and brothers John and Benjamin Adams and their families, and Spencer�s son-in-law Archelaus Craft (Rev. War Vet. and the progenitor of Kentucky Craft family). The Colony was located in the area around what is today Mayking, Kentucky. The Colony grew with the addition of Bates, Bentley, Caudill, Collins, Hamons, Hogg, Holbrook, and Wright families. John Adams is known as Old John of All. His wife is thought to be a Caudill. His descendants live in Whitley, Magoffin, Morgan, Floyd, Knott, Perry, and Letcher counties. His son Stephen moved to Magoffin County and founded a branch of the family. William Adams, John' brother died of measles at Valley Forge. His son Moses came to Kentucky in the early 1800s. He married Mary Garland of Carter County Tennessee. They had four daughters and six sons, all of which married into the pioneer families. Their son William Tolson Adams married his cousin Frankie Adams (d.o. Stephen and Mollie Webb) and are our direct ancestors. The Adamses were prolific and virile and spread their family throughout the Kentucky highlands providing many religious and civic leaders to the region.